We are a professional group with 10 years experiences of making handmade hair accessories, our goal is let all customers receive best handmade hair bow. The material is high quality cotton ribbon and alligator clips, no formaldehyde, no heavy metals, no aromatic, no pilling. 10pcs hair clips as pictures each pack, suit for any outfits. Do not blench, handwash only. The color of our girls barrettes may have slight difference from the listing picture because of different camera lens and light environment. There may be slight variations in size and shape in each barrettes, because all of our baby girls barrettes are handmade. Any of your reasonable feedbacks and reviews are best motivation for us! 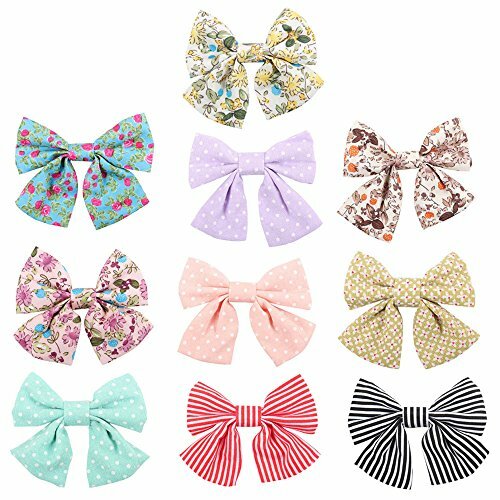 You will get 10pcs different style 3.5 inches hair bow clips , various colors and patterns suit for any outfits. High quality light alligator clips can clamp your hair easily and gently. We use best and soft fabric catton ribbon to make the bow and non-toxic hot glued onto the clip, it's very hard to tear apart them. Our hair bow is a great gift choice, no one will reject barrettes with traditional colorful bow and various patterns . Our hair bow is a perfect hair accessory for your little girls. If you have any questions about this product by Oaoleer, contact us by completing and submitting the form below. If you are looking for a specif part number, please include it with your message.